Part of the LHC at CERN. I entered the packed cafeteria with tray in hand, searching for the right food to eat. Around me, hundreds of people of all ages spoke excitedly in dozens of different languages, commenting on each other's ideas, asking questions, and thinking of the next steps in their research programs. Lunchtime at the United Nations? No. Lunchtime at CERN, the European laboratory for particle physics, home of the Large Hadron Collider (LHC) — the huge machine that famously discovered the Higgs boson in 2012. I'm spending a month here as a visiting scientist to keep up with the latest results and present some of my own. "Crowded today, huh?," I said to my friend Michelangelo Mangano, a world-renowned particle physicist and member of CERN's famed Theory Group. "Now?" he asks. "It's empty!" High-energy particle physics sounds like a very esoteric subject. And, to most people, it is. But once you step into CERN, it's a way of life. Everything here revolves around solving one of nature's most stubborn mysteries, the fundamental material composition of the universe. The essential idea, reminiscent of ancient Greece, is that matter is made of basic building blocks, chunks of stuff that cannot be broken down into smaller constituents. Particle physicists do many things, but the grand task is to find these constituents and figure out how they interact with one another. To do that, one can't use microscopes. After all, microscopes are also made of particles. The method is as simple as it is violent: You crash particles into one another at huge speeds and see what happens. To crash the particles, you need to first extract them from chunks of stuff and align them into tracks like racing horses. At the LHC, protons are yanked from hydrogen atoms and funneled into a small linear accelerator known as LINAC. The protons, having positive electric charge, respond to pulls from electric fields somewhat like a child going down a slide due to gravity. When their speed is high enough, they are injected into the huge 16.7-mile-long circular underground tunnel that makes the LHC the biggest machine in the world. Once in the tunnel, a combination of powerful electric and magnetic fields accelerate and guide tight bunches of protons around vacuum-sealed pipes in clockwise and counterclockwise directions — their speeds increasing at every turn — until they are moving at a tiny fraction below the speed of light, 186,000 miles per second (You blink your eye and light goes seven and a half times around the Earth). At that point, the bunches of protons are made to hit head-on. What happens then is one of nature's most spectacular feats, the transmutation of energy into matter. As Einstein's famous E=mc2 formula states, it is possible to convert energy into matter and vice-versa. The energy here is the energy of motion of the protons which, as they move close to the speed of light, is huge. This is the core challenge for accelerators: The most powerful ones are those that can make particles reach the highest speeds and thus energies. This explains the gigantic dimensions of the LHC: The long tunnel exposes the protons to speed-boosting electric fields, so that they can collide at record-breaking energies. When protons hit protons at high energies, particles fly out in all directions like fireworks. Bang! The task of the physicists is then to analyze the tracks of these particles to figure out who they are and what energies they have. The accounting must be highly precise so that the results are trustworthy. If nature is generous, new particles will show up in the accounting. This is where the detectors come in. Located along the tunnel, which crosses the Swiss-French border four times, are CERN's four main experiments, the detectors. As the name says, detectors are huge machines designed to track the particles, in a sense like super-sensitive photographic cameras. Different detectors measure different properties of the outgoing particles, being designed to answer specific questions. For example, CERN's two main detectors — the 7,000-tonne Atlas and the 14,000-tonne CMS — search for the Higgs, for the possibility of extra dimensions of space, and for particles that could make up dark matter. They look somewhat like cylindrical onions, each layer designed to track the direction, momentum (related to the speed), and energy of the particles flying away from the collision point. It takes more than 3,000 scientists from 174 institutes and 38 countries to run Atlas experiment. CMS employs about 4,300 scientists. Add to these the many seminars, research workshops, and summer schools and you understand why the CERN cafeteria gets so crowded. Atlas and CMS have similar scientific objectives, although their design is very different. This is an essential point, as they can thus check each other's results, legitimizing or ruling them out. An essential aspect of laboratory experiments is that they should be repeatable by independent groups. If one detector sees a sign of a potential new particle, the other must find it, too. Otherwise, the results are not credible. The other two detectors along the LHC tunnel are ALICE and LHCb, both designed for a specific task. 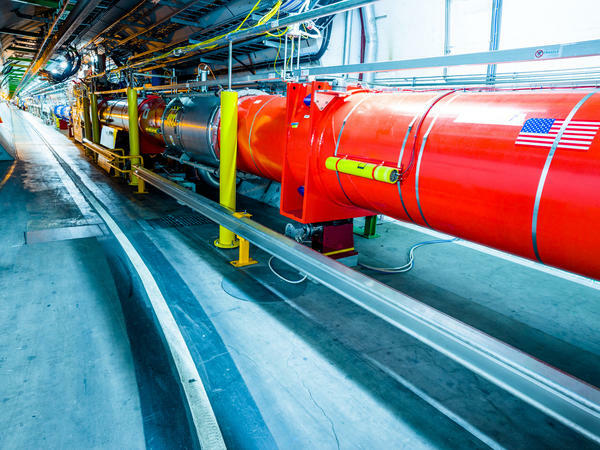 ALICE studies the so-called quark-gluon plasma, a state of matter thought to have been prevalent a fraction of a second after the Big Bang, before protons and neutrons existed. Each proton and neutron is made out of three quarks. Gluons are the particles that, as the name says, glue the quarks together into protons and neutrons. As we get closer to the origin of the universe, space gets compressed and particles are squeezed into one another at increasingly high pressures. At some point, theorists predict, the squeezing is so dramatic that protons and neutrons (and other more exotic particles) sort of dissolve into their fundamental constituents, quarks and gluons. This primordial soup is the quark-gluon plasma. Results to-date have strongly confirmed the existence of this state of matter, although much remains to be understood of its complex properties. The fourth detector, LHCb was designed to shed light on one of the biggest mysteries in physics, why the universe is composed mostly of matter and no antimatter. According to the laws of fundamental physics, every particle of nature should have an antiparticle cousin, essentially identical but for having the opposite electric charge (plus other more technical differences). However, if they existed in equal numbers, the universe would be radically different, a soup of mostly radiation and a few isolated particles of matter here and there. This is because when particles meet their antiparticles, they annihilate into a puff of radiation. (More precisely, gamma-ray photons, a very energetic form of electromagnetic radiation.) If this were the case, we wouldn't be here to try to figure things out. Together, the four LHC detectors are a true marvel of technological ingenuity. That we have come this far from the first musings on the composition of matter over two millennia ago in ancient Greece and India is a testimony to our perseverance and ability to work together toward a common goal. In a world so sharply divided by cultural and economic warfare, what happens at CERN stands out as a celebration of the best we have to offer. For this reason, and regardless of the scientific results found here, this is a place we all should celebrate.